‎"Arrey oh baabu mushoy, hum to rangmanch ki kathputliyan hain jiski dor us upar wale ke haathon main hai.. kab, kaun kahan uthega ye koi nahin janta " This dialogue of Rajesh Khanna, which made him immortal for years to come. Rajesh Khanna also popularly known as 'Kaka', debuted with the Bollywood film 'Aakhri khat' in 1966 and then gave many successful movies like Anand,' Raaz', 'Baharon ke sapnay', 'Ittefaq', Aradhna, Bawarchi and many more. He was the first superstar of Bollywood, born in a Amritsar, Punjab as Jatin Khanna on 29th December 1942, was adopted and raised by foster parents who were relatives to his biological parents. 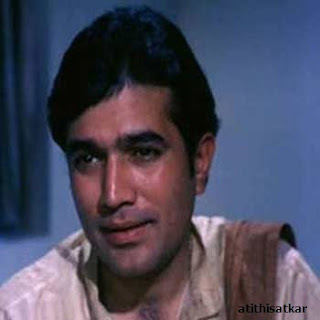 Rajesh khanna acted in as many as 163 movies and out of which 128 movies cast him as the lead actor. He won 3 Filmfare 'Best actor award' and had been nominated for the same for about 14 times. He is also the winner of BFJA award for best actor and he won this for maximum times that is 4 times and he was nominated for the same for about 25 times. In the year 2004 he was awarded with special award of filmfare and in the year 2005 he was awarded lifetime achievement award for completing 25 years in Hindi film industry. In the early 1960s he had fallen in love with Anju Mahendru and their relationship lived for 7 years and after breakup Rajesh Khanna met Dimple Kapadia and married to her. In 1984 they separated but didn't divorce each other and after some time spent separately they forget all bitterness and then lived together. Dimple Kapadia gave birth to two daughters twinkle Khanna and Rinki Khanna, both former Bollywood actress. twinkle Khanna married to Akshay Kumar and Rinki Khanna married to a London based investment banker Samir Saran. In the year 1992 he joined congress party and won by-election from New Delhi. He then turned to a politician after becoming the MP and refused many Bollywood assignments thereafter. In June 2012, he felt some problem in kidney and admitted to Lilavati Hospital in mumbai. On 18th July 2012 he died in his home Aashirwad, Mumbai due to kidney failure.